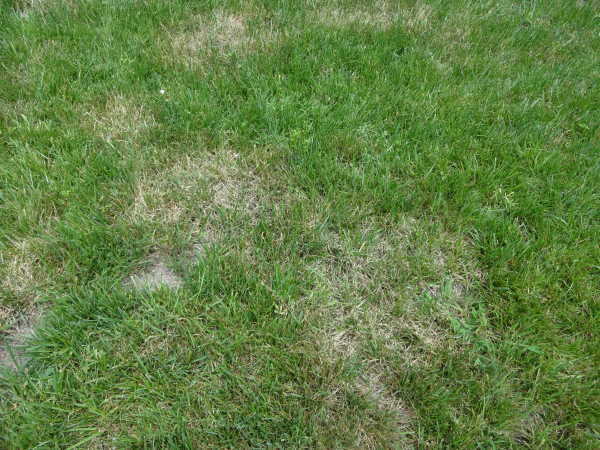 Brown Patch is one of the more common summer lawn diseases in our area effecting homeowners with fescue lawns. The effects can be unsightly and aggravating to those who appreciate a well manicured lawn and can even be deadly to the grass plant itself. The disease is exactly what it is called, a brown patch that appears in the lawn, and typically several patches will appear. These patches are usually circular, brown and can be as range from a few inches in diameter to a few feet in diameter. Brown patch is best known for targeting cool season grasses like tall fescue and rye grass but could still affect warm season grasses like zoysia. The most common cause for this disease is the weather. Long periods of hot & humid weather promote the perfect climate for this disease. Conditions are ideal when the low temperature overnight is 68 degrees or higher. Another large factor contributing to brown patch is too much nitrogen in the soil, excess watering or rainfall as well as a lawn that has not been aerated or dethatched. Aeration and dethatching reduce some of the soil compaction and allows the soil to breathe properly. How to Treat Brown Patch? One of the best treatments is by being on a proper lawn care regime, following the correct watering habits, aerating the lawn and having patience. Once the overnight temperature is consistently below 68 degrees, brown patch will begin to fade naturally. However, for anyone who wishes to treat this disease quickly a curative fungicide treatment can be used; however this can be a costly option. To sum it up, brown patch, like any other disease, is unsightly but is treatable with the right amount of time and patience. Just as easily as Mother Nature can cause a disease, she will also take it away.